With any transportation system, reliability is a critical metric. Being stuck in stop and go traffic can really get the blood boiling for most people. The same is true for transit users, with the added expectation that transit service arrives and leaves within a few minutes of its scheduled time. The SkyTrain network runs in its own right-of-way and is automated. This means that the system should be extremely reliable. SkyTrain reliability has historical been extremely high, but reliability drop in 2014 as a result of some serious breakdowns. This led to an independent review which made 20 recommendations to improve reliability. Since that time, reliability has improved. TransLink recently released 2017 year-end reliability statistics, and it is good news for SkyTrain. In 2017, 95.3% of trains arrived within 3 minutes of their scheduled time. 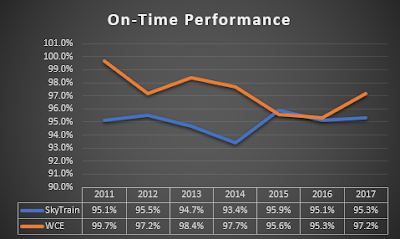 SkyTrain and West Coast Express on-time performance between 2011 and 2017. Select chart to enlarge. West Coast Express commuter rail has historically also been extremely reliable, but on-time performance started dropping in 2015 due to scheduling challenges between commuter and freight trains. In 2017, on-time performance increased with 97.2% of trains arriving within 5 minutes of their scheduled time. This increase in performance was due to reduced freight traffic on the commuter corridor. Ensuring the reliability of bus service is extremely difficult as buses share lanes with other vehicles for the most part. This means that buses are susceptible to both time-of-day congestion, and congestion caused by crashes. That being said, TransLink was able to make some modest improvements to on-time performance on its bus network. 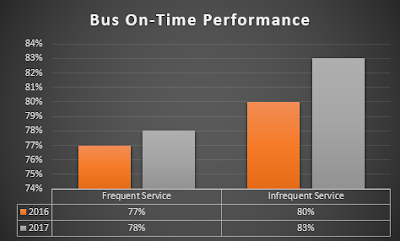 Bus on-time performance over the last two years. Select chart to enlarge. As a transit user, one of the most frustrating things is when a bus leaves early from a stop on an infrequent route. TransLink and its subsidiaries have been working to reduce the amount of buses that leaving early from stops. For example on the Fraser Highway corridor, bus operators now wait at certain stops if they are running early. TransLink’s operating subsidiary, Coast Mountain Bus, has added “on-time performance discussions” to operators’ annual performance reviews, looking at each operator’s early leave and late arrival metrics. 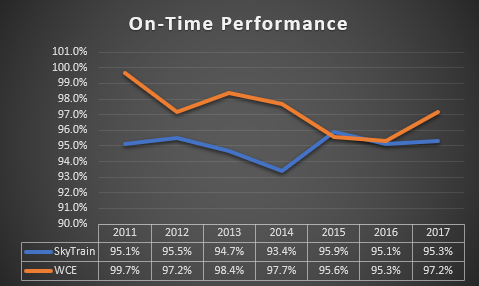 It is encouraging to see that the overall on-time reliability is increasing for all modes within our region’s transit network.